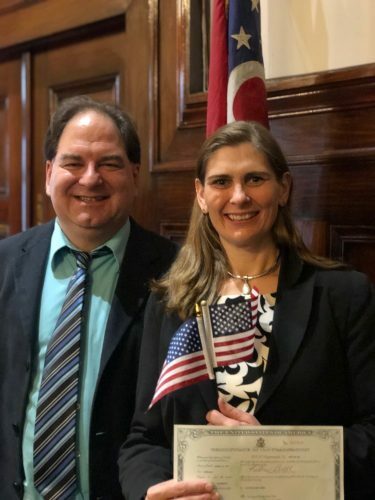 After 18 years of living in the United States, two Youngstown State University professors and Canada natives earned their U.S. citizenship on Jan. 24. Patrick Durrell, professor of astronomy and Katherine Durrell, professor of physics, arrived in the U.S. in 2000 from Vancouver, British Columbia, Canada. Patrick Durrell said work opportunities determined the couple’s decision to come to the U.S.
Patrick Durrell was offered a position as a postdoctoral researcher at Penn State, and after four years, he earned a tenure track faculty position at YSU. He is originally from the province of British Columbia, where he was a postdoctoral fellow at the University of British Columbia, and Katherine Durrell is from the province of New Brunswick. After nine years of permanent resident status in the U.S., the professors decided to apply for naturalization. “The process involves getting biometrics, including photographs and fingerprints and a personal interview, including a test of our knowledge of U.S. history and command of the English language,” Patrick Durrell said. He said the most challenging aspect of the thorough naturalization process was the application itself. Patrick Durrell said he believes one of the most important abilities granted with U.S. citizenship is the right to vote. Anthony Nakley, a junior finance major, said Patrick and Katherine Durrell are important to the community and was happy to hear the news of their U.S. citizenship. “Earning their citizenships strengthens the bond and commitment to YSU and the country,” he said. Nakley is a member of the fencing team at YSU, where Katherine Durrell is the adviser. Mykaela Wagner, a graduate student, agreed both professors care about the student body and was enrolled in their astronomy and physics courses. Although the professors miss Canada, Patrick Durrell said they both look forward to the many good years ahead of them at YSU.